I love it when hubby bakes lasagne (lasagna). It’s one of the simple dishes we have for dinner. Yes, dinner. Unlike in the Philippines, lasagne is considered as “meryenda” (afternoon snacks or meal). I don’t know now but I remember when I attending a workshop we were being served a lasagne for our afternoon snacks. I think that was the first I ate it. I don’t even remember how it tasted. Hubby’s lasagne is not sloppy. He does the meat sauce just like the spaghetti sauce and he uses fresh lasagne sheets. Sometimes he makes the white sauce but sometimes he just buy ready-to-use pack. 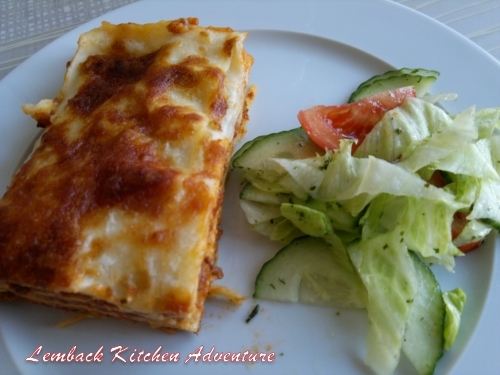 Lasagne is good as dinner meal or just something to eat when you don’t want heavy meals. Green salad goes perfect with it or any salad you like will do.